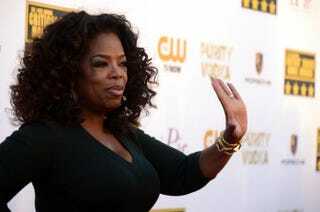 The Oprah Winfrey Network on Friday filed a lawsuit against a Florida man who allegedly pretended to be the star’s nephew to win jobs and gifts, according to the Hollywood Reporter. Justin Jackson allegedly created OWN stationery to send letters that appeared to be from Winfrey in an effort to obtain jobs with Perry Ellis and the Atlantic Hotel, the report says. The network was joined in the suit filed in federal court in Florida by other alleged victims, including Reggie Love—a former college basketball player and personal aide to President Barack Obama–and Scott Garner, OWN’s executive vice president of scheduling and acquisitions, the report says. Among the allegations against Jackson is that he urged the hotel company Extended Stay America to hire him and a Florida woman named Angel Agarrat, also a defendant in the lawsuit, because Winfrey would like to visit them at the hotel in Miami. Jackson is accused of trying to obtain free stuff from Converse, Carter’s clothing company, David Yurman, Pandora, Tacori and Tory Burch, as well as access to singer Trey Songz, by claiming association with Winfrey and OWN. The suit also accuses Jackson of impersonating Johnny Depp’s manager to obtain tickets to Oprah’s show in Miami. In 2007, the suit claims, Jackson posed as Madonna’s manager to get $2.4 million in Chopard jewelry for a fake photo shoot. He was convicted of grand theft for selling the jewelry, the report says. And in 2010 he allegedly impersonated Love to obtain Juicy Couture clothing and handbags and Cheesecake Factory gift certificates and was arrested on charges of fraud and impersonating a public officer, the report says. The suit says he jumped bail and has an arrest warrant in Georgia. The Hollywood Reporter says it sought comment from Agarrat. Jackson could not be reached.